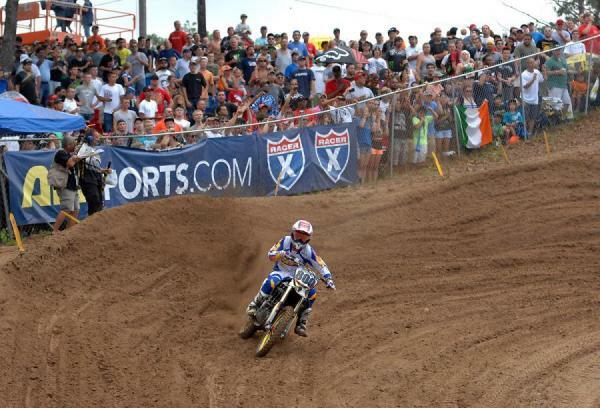 Southwick, Massachusetts' MX-338 track, host site of round nine of the Lucas Oil Pro Motocross Championship sanctioned by AMA Pro Racing, is beginning to garner quite the rep for the unexpected. On this wild race day, the uniqueness of the track's sandy soil was actually just a side note--plenty of other really strange things happened throughout the day. We're not talking once-a-year-we-race-on-a-sand-track-stuff, we're talking you-can't-remember-the-last-time-you-saw-it-happen stuff. Ready? In the first 450 moto, Mike Alessi scored his customary holeshot on his MotoConcepts 450, while a ton of riders went down early, including contenders like Monster Energy Kawasaki's Tyla Rattray, Team Honda Muscle Milk's Justin Brayton and BTOSports.com BBMX Suzuki's Michael Byrne. Mike Alessi led the first moto after getting the holeshot. Yes we copied and pasted that caption in from various other racer reports. 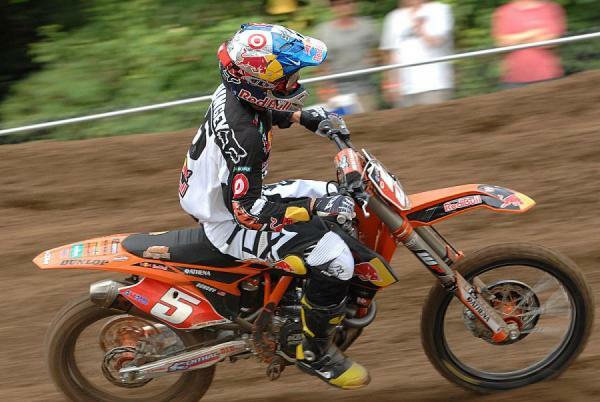 Ryan Dungey was able to get around Alessi in moto one and go on for an uncontested win. Yes we copied and pasted that caption in from various other race reports. Southwick was epically awesome as always. Alessi led new 450 entrant Phil Nicoletti early, but soon Red Bull KTM's series leader Ryan Dungey rolled into second and closed on Alessi. Once again Alessi proved game for the challenge from Dungey, riding smart lines and protecting the lead until near the halfway point, when Dungey found an opening on the inside and sliced his way around him. From there, Dungey pulled away to nab his 12th moto win in the last 13 motos. Alessi took another second, and Team Honda Muscle Milk's Tommy Hahn rallied for a solid third. Hahn, who has been through quite a few rough moments over the last few years, actually had to hold back tears on the podium after making his way back to the box. Also pumped was Massachusett's own Robbie Marshall, who put his Munn Racing KTM into a solid fourth-place finish. Okay, but you're saying, "That moto didn't seem that strange." 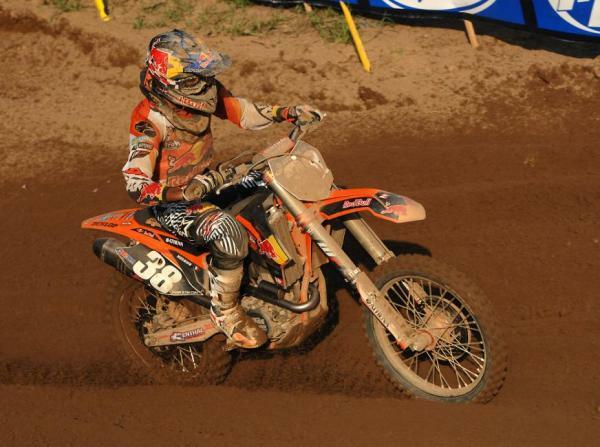 Well, here comes moto two, which also started in normal fashion, as Alessi grabbed another good start. 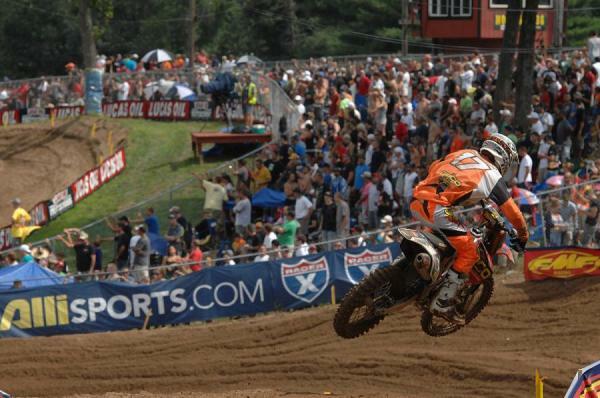 Dungey quickly passed him and began to take off with the lead. Considering Dungey had won the last six races overall, it seemed like the race was over. 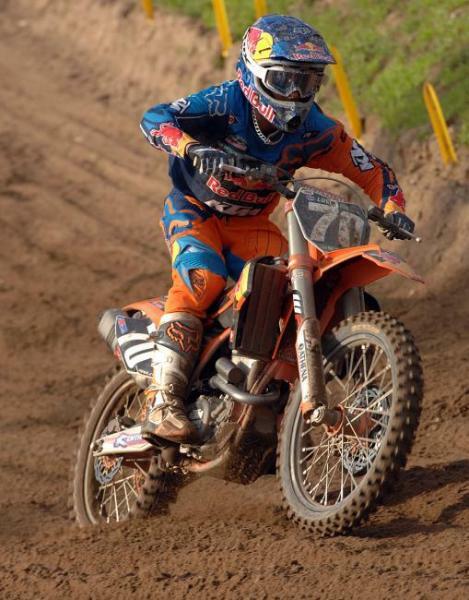 Yes, it was all clear, until suddenly the Red Bull KTM rider went down when he cross rutted on the landing of a jump! This rare crash from Dungey seemed odd, but then his mistake was made worse when his gas cap popped off, and fuel started pouring out of his bike. After an unexpected crash knocked his gas cap loose, The Dunge had to screw the cap back on. But that was only the beginning! 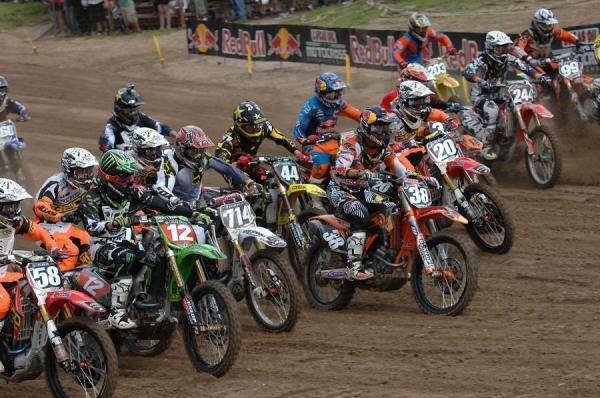 You might not see Alessi in this photo but he's about to grab a second moto holeshot anyway. 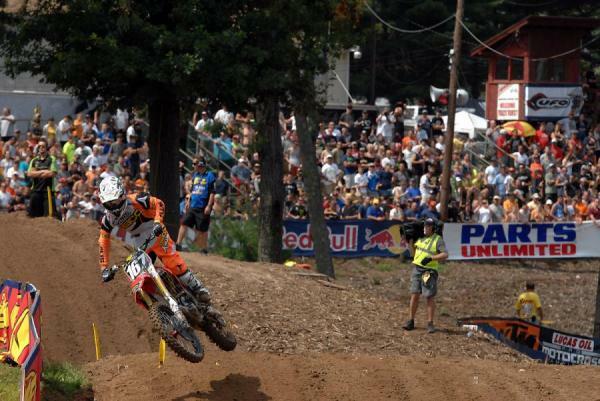 And when Dungey went down, he grabbed the lead again, but wasn't able to hold it. "I was basically handed it on a silver platter and didn't execute," said Alessi post-race. Dungey got up in second but quickly overhauled Alessi again for the lead. This race finally presented Alessi's chance to win an overall, but he couldn't find the speed when he needed it in moto two. Rattray, on a rail in the second moto after a crash-filled first race, got past Alessi for second. 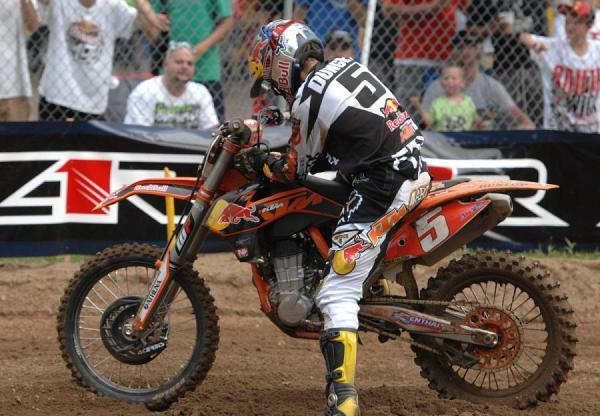 Dungey began to build a lead, but, his team was obviously concerned he would not have enough fuel to finish the moto. And then came one of the most bizarre moments the series has seen in awhile, as Dungey pulled into the mechanics' area to refuel! Dungey had about a 14-second lead on Rattray when he pulled in, and then he rolled back onto the track right behind Rattray in second. So, in case your wondering how long a motocross pit stop would take, it's about 14 seconds. Dungey pulled back out of the mechanic's area ahead of Alessi, so he still held the overall lead, but he went after Rattray for the moto win anyway. He came close but could not make the pass, and Rattray held on for his first 450 moto win. Dungey's 1-2 scores gave him the overall win-despite the pit stop--with Alessi going 2-3 for second. Third overall went to Broc Tickle, one of the rare consistent riders on the day, with 6-4 scores. First moto heroes Marshall (first lap crash) and Hahn (crashed out) had their problems in moto two. Tyla Rattray went on to win the second moto, while Dungey held onto the overall win with 1-2 scores. Alessi and Broc Tickle rounded out the overall podium. Tickle and Alessi joined Dungey on the overall podium, but Tyla Rattray was no slouch, either. 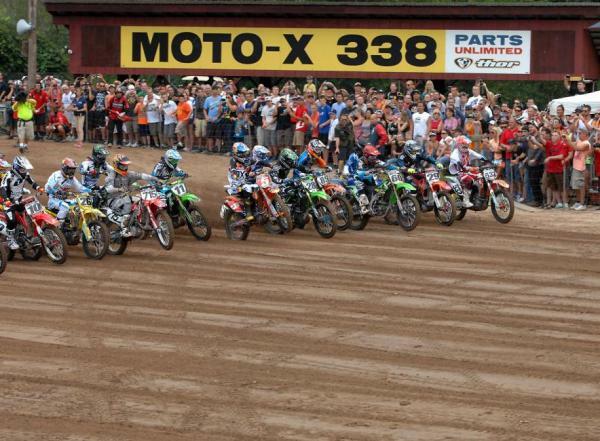 The 250 class was awfully crazy, as well. It started with GEICO Honda's Zach Bell grabbing the holeshot in his very first pro race. He led several laps, while his teammates Justin Barcia and Wil Hahn were down with a pile of others in the second turn. Hahn was stuck under his bike, and good samaritan Mike McDade actually pulled his bike off of him before getting on his own bike and taking off as well. It took about 12 seconds for Zach Bell to make an impact in the pro ranks, as he nailed the moto one holeshot. Eli Tomac soon got around his teammate Bell and jetted off with the moto one win. The Marv Attack finished a season-best second in moto one. 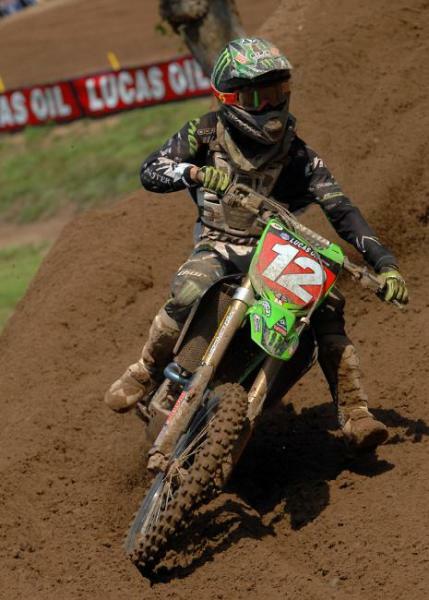 Up front, Bell soon came under pressure from his teammate Eli Tomac, and then yielded the lead to him. A few turns later, Bell went down hard and crashed out--ending his debut day. From there Tomac built a big lead, topping Red Bull KTM's Marvin Musquin and points leader Blake Baggett on a Monster Energy Pro Circuit Kawasaki. Barcia, winner of the last race and second in points in Baggett, fought back to seventh. In moto two, Lucas Oil Troy Lee Honda's Jessy Nelson grabbed the holeshot, but Red Bull KTM's Ken Roczen, fourth in moto one, took the lead and pulled away. Tomac tipped over and went back to tenth early, while Baggett worked his way into second and went after Roczen. 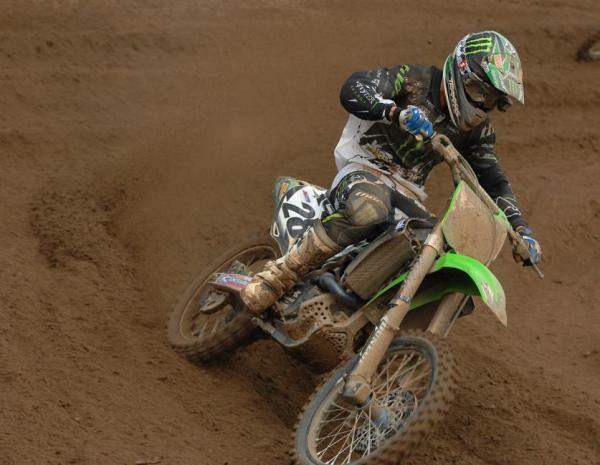 The always-competitive 250 class provided an extra dose of drama ar Southwick. Ken Roczen added to his impressive laps led total by leading most of moto two, and pushing Blake Baggett to the max. Even the super-fit Blake Baggett admitted he was toast by the last laps of moto two. Barcia moved up to third before hitting a tree on the inside of a turn and going down. Tomac would rally into third, but he was nearly 20 seconds down on the lead duo of Roczen and Baggett. Incredibly, he started making up all of that ground, closing in as much as four seconds per lap (!) and catching Baggett. He then made the pass for second, but in the very next turn, tagged the same tree Barcia did and went down. This put Baggett back into second, but Tomac, with 1-3 scores would still win the overall--unless Baggett could get around Roczen. Granted, Roczen has gotten passed for the lead late in the race a few times this year, but he was exceptionally tough on this day. Baggett got past and then Roczen passed him back, and then even pulled away again, before Baggett mounted one last ditch charge, made a pass, and took the lead. Baggett's 3-1 scores gave him the overall via the tiebreaker against Tomac's 1-3. Roczen (4-2) was third overall. 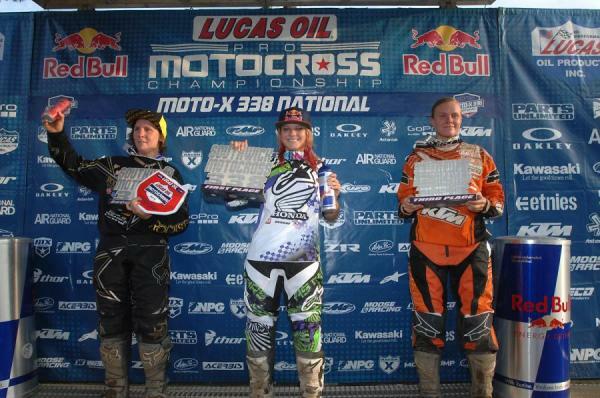 The WMX class was back in action, and the championship fight there grew even tighter. Honda's Ashley Fiolek continued her recent run of strong riding by taking 1-1 scores and another overall win, while points leader Jessica Patterson went 2-2 on her Rockstar Suzuki. Patterson, riding with a surgically repaired hand, now holds just a five-point lead on Fiolek with one race to go in the WMX Series. Lucas Oil Troy Lee Honda's Tarah Gieger was third in moto one, but only took fifth in moto two, pushing her back to third in the standings, 10 points behind Patterson. Sweden's Sarah Petterson took third overall for the day. Fiolek centers the WMX podium again, and has a very real shot at another championshp at the WMX finale in Lake Elsinore. 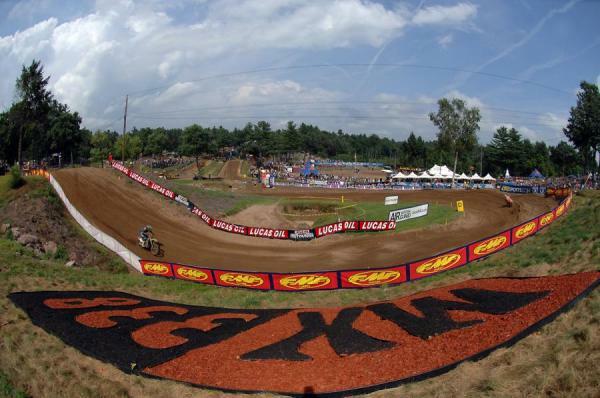 Moto-X 338 - Southwick Mass. Rattray rewarded Kawasaki's faith in him by nailing a moto win.